The Polar Pioneer offers an intimate way to discover Antarctica as it is one of the smallest passenger Antarctic cruises with only 68 guests. Whether you opt to relax in the polar lounge, observe wildlife on ample deck areas, the Polar Pioneer has special Antarctic activities for you to make your experience truly memorable. Book the Polar Pioneer Cruise for selected 2017/18 Antarctica expeditions and SAVE UP TO US$1,500 per person in ANY cabin category. 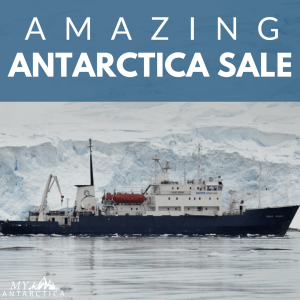 You can choose from a range of different Antarctica cruise programs, from discovering the Antarctic Peninsula, to the wilderness of South Georgia Islands and even the Falkland Islands and the Weddell Sea. OFFER ENDS 31 JULY 2017! The promotion is available on all new bookings, in any cabin categories, made before 31 July 2017. The promotion is subject to voyage availability. The promotion is not available in conjunction with any other offer, or is not redeemable for cash. Normal booking terms and conditions apply. A signed booking form and US$2,500 deposit per person must be made within 7 days of reserved berth/s to confirm the booking. Promotion ends 31 July 2017. Other terms and conditions may apply. Do you charge a solo sup. Do you have single cabins.